In eye watering news, China’s biggest banks have lent 1.3 tn yuan to stop the slide in Chinese shares. The money was lent to state-backed China Securities Finance (CSF), which then loans the money to investors for buying shares in a practice known as margin lending (ie they’re buying shares on debt). This tells us how much the recent rebound in the country’s stock market was reliant on state intervention. 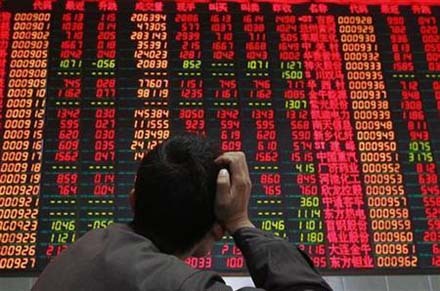 As Paul Krugman warns us, government attempts to stop stock market collapses are bound to fail. But the Chinese government is doing it for a very good reason. “I believe it’s more political risk. The top authorities are fretting that the sharp pullback could lead to social unrest,” Zhang Yidong, chief strategist at Industrial Securities told The Wall Street Journal. Well-functioning equity markets are created by policies that strengthen the financial and economic architecture, not with those that meddle with prices. The Chinese government doesn’t have a clue. The point is that by encouraging people to buy shares, by lending them money, the Chinese government is encouraging another market bubble even as the existing one deflates. And that will mean more stock market upheaval. This entry was posted on July 18, 2015 at 6:44 am and is filed under Uncategorized. You can follow any responses to this entry through the RSS 2.0 feed. You can leave a response, or trackback from your own site.